Here is my submission for september’s Tie One On challenge–the dishtowel apron. I kept putting it off because I knew this was a pretty easy sewing project. So here I am on the last day, finally getting mine finished. I used some martha stewart towels that I found on sale at KMart. I also added this wide sash to get some extra length otherwise it would have been a mini-skirt apron. The sash is folded down in half, and I realized when I put it on, that it will make a great maternity apron, too. (whenever that joyous time comes around again in my life–by the way, i’m not pregnant). So, I love it, and it may possibly have moved into the position of my favorite apron. Handmade things always have more meaning. Other than tie one on projects I have been up to my elbows in wallpaper. Several months ago Dan and I ripped the glittery butterfly wallpaper down from our bedroom walls. It was the kind of wallpaper that if you caught it in the right light, you could pick up a whole new silver, hollographic pattern hidden in the background of the paper. But I have to admit, that peeling the wallpaper off is somewhat therapeutic. Like peeling sunburn or pulling back overgrown grass to reveal a whole new section of sidewalk you never knew was there…. So now we are down to the "brown board", which is apparently the old-fashioned version of drywall. Our visitors come sunday. I’ll keep you updated on the progress. Okay I LOVE this apron. It is perfect, I love the simplicity of the A line because those polkadots are perfect for a simple silhoutte! I love the colors. I love the diagonal pocket. I simple little detail that adds so much character. 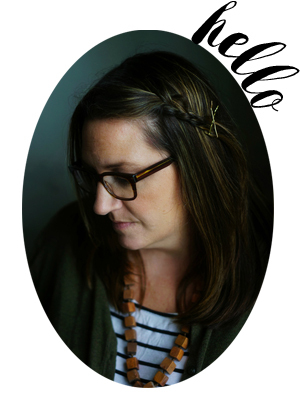 Golly- so many craft blogger friends I have. I want to be crafty!!!! Very cute apron. Polka dots are so fun. Today is October 1. I guess I missed the September tie one on theme. Oh well. Maybe she will have another easy month coming up soon…LOLI love your wide baseboard trim. How exciting, you’ll soon have a new bedroom. I really like that apron. It’s so spring like. I love your apron-the color, design, the print-awesome! love the apron!!!!! Those are my favorite MS dish towels! 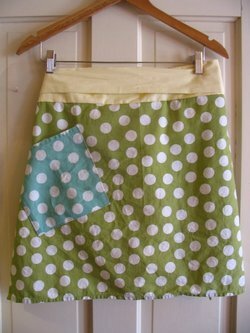 The apron you made is so cute-I love the polka dots and the colors! Very fun! I am totally loving this apron!! I have those dish towels! and I love them! (though I must admit to playing favorites… I tend to use the yellow and turquoise ones most)…! super-cute apron! makes me wish I could sew. Love the apron, the pocket is fab! i’m really into spots at the moment too. 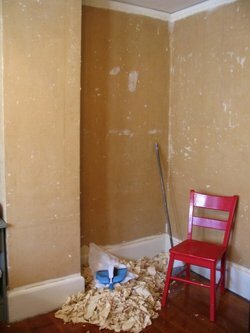 i know how it feels stripping wallpaper after having done two rooms last year but it was so good when it was all finished and freshly painted.